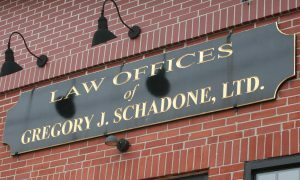 Success Stories – The Law Offices of Gregory J. Schadone, LTD.
Our success stories are not based on the highest awards received but rather are true success stories of cases where zealous representation resulted in a recovery substantially higher than that of a previous offer to settle. Two elderly sisters over 80 years of age were broad sided by a trailer truck. One sister died upon impact and the other sustained multiple serious injuries resulting in one month stay in the hospital and another two months in rehabilitation. There were extensive negotiations before a settlement was reached. Our office retained expert medical opinions to substantiate our case. The claim for the estate of the deceased sister settled for an undisclosed amount. The claim for the sister who survived settled for $600,000.00. A 15 year old child ran into the road while playing with friends and was hit by a vehicle. The boy sustained an injury to his head, which resulted in a small scar above his eyebrow. The automobile insurance carrier denied the claim stating that it was the boy’s fault and that there was nothing their insured could do to avoid the accident. They offered $0 to settle the claim. Our firm aggressively prosecuted our client’s claim and received a binding arbitration award for policy limits of $25,000.00. A 25 year old male was a passenger in his own vehicle when the driver lost control and hit a telephone pole. Our client sustained a fractured ankle. Neither the vehicle nor the driver was insured. Two attorneys advised him that there was no insurance to make a claim against. Five years following the accident our office was consulted. After a thorough investigation, the Law Offices of Gregory J Schadone located a valid policy under which our client was able to recover. The case settled for $35,100.00. A 25-year-old female was rear ended in Coventry, RI. She sustained a cervical disc herniation at C6-7. The visible damage was minimal and the police officer wrote that he estimated it to be less than $100.00. The appraisal by the insurance company estimated the damage to her vehicle to be $1,179.00. The other driver’s insurance carrier alleged that there was a minor impact and that she could not have possibly sustained a serious injury in this accident. The insurance carrier further alleged that the injuries were not related due to an eight-month gap in treatment. There were expert opinions by the insurance company to support their position. Our office also retained expert witnesses. There was an offer of $3,320.00 to settle the case. After our office aggressively litigated the matter our client received a favorable arbitration award. The case settled before trial for $185,000.00. A 14-year-old girl was a passenger on a bus that was involved in an accident. She sustained a disc protrusion at L5/S1 resulting in surgery. After aggressive litigation and trial only days away the matter settled for $120,000.00. A corporate client was owed $231,454.00. After unsuccessful collection of the debt they referred the matter to our office for collection. After litigating the matter and aggressively pursuing collection against the debtor, our client recovered all sums due to it along with interest. A 25 year old female was a passenger involved in a motor vehicle accident resulting in an L4-5 disc herniation. Within three months of the accident our office recovered policy limits of $25,000.00 against one of the driver’s insurance carrier. Within the next three months our office recovered policy limits of $25,000.00 again against the other driver’s insurance carrier. A 24-year-old female was involved in a motor vehicle accident in Cranston, RI. She sustained an L4-5 disc herniation. The other driver’s insurance carrier offered 25% to settle her property damage claim. They alleged out client was 75% at fault for the accident. After filing a law suit and aggressive litigation and a favorable arbitration award, the matter settled before trial for $84,000.00. A 40 year-old female medical doctor had a hip replacement. The prosthesis should have lasted approximately twelve years, but failed after only three years. The manufacturer initially denied that the product was. Our office sued the hip manufacturer base on a products liability theory. After extensive litigation and mediation the matter settled for $294,279.24. A 35 year old right handed male injured his right shoulder in a three car accident. He was required to have arthroscopic surgery. Our client played organized baseball and the insurance company alleged the injury was a result of years of playing baseball. There was an offer made to settle the matter for $3,500. After extensive litigation the matter was resolved by binding arbitration. Our client was awarded $46,674.00.